Merging unconnected line segments using ArcGIS Desktop? I am looking for a way to connect line segments that are unconnected. 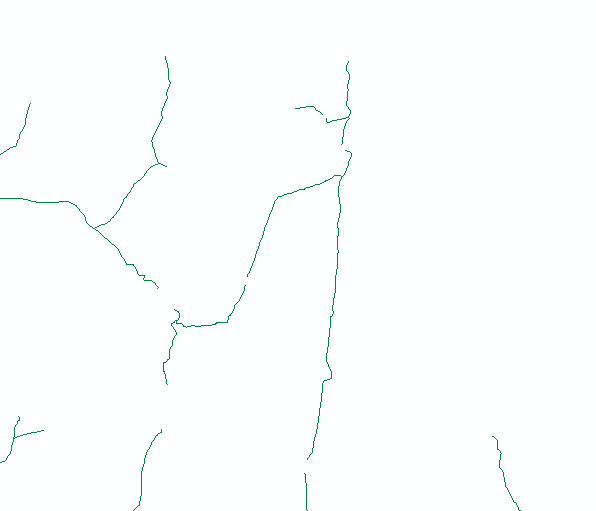 It is a shapefile for a network of rivers and all the lines are slightly disconnected. Is there something like aggregate polygons but for lines? Edit My river data is not continuous but I would like it to be so I can run simplification tools on it for a generalized map. The lines don't always touch so when I try to generalize, it doesn't work. I want to connect the line together automatically. You can create a Geometric Network based on your hydro feature class, as described in this Esri tutorial. If you want to go a quicker route, use the Create Geometric Network tool - for this you will need to have created a spatially referenced Feature Dataset (stored in a geodatabase of some kind), within which you will save the Network. When you go through the options to create the Network, you can set the "Snap Tolerance" to a distance value specifying the max distance where gaps will be snapped together. Obviously, the input feature class will be your hydro features. When it is created, you can re-create with different snapping tolerance using Rebuild Geometric Network if necessary, but you can either convert back to a new feature class or else simply display the Geometric Network on your map, with no added generalization necessary. Not the answer you're looking for? Browse other questions tagged arcgis-desktop line generalization or ask your own question. How to style the end of a line? Creating measured line segments along existing polylines from starting point? Unsplit/Dissolve multiple touching lines in Stream Network using ArcGIS Desktop? Wrong calculation of line start and end XY coordinates of a merged line- how can I fix this? Splitting line into segments of different length with ArcGIS Desktop?